Current Research in Pharmaceutical Sciences (CRPS), a Multidisciplinary Pharmacy Journal is an Online,Peer Reviewed International Journal and publishes from Empro, India. Our website, www.crpsonline.com is web-based center for pharmaceutical information. CRPS is an official journal of Empro Professional Scientific Association (EPSA). EPSA is a scientific and educational society, which is registered under the M.P. Society RegistrikaranAdhiniyam, 1973, No.44 of 1973. CRPS publishes manuscripts (original research, review articles, mini reviews, short communication and case study) on original work either experimental or theoretical in pharmacy or relevant areas. 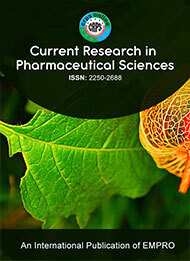 CRPS publishes 04 issues per year per volume. Articles are published online with full open access. Any researchers can submit proposal for organizing special issues, but the final decision will be from editorial office. And, special issues or proceedings are also considered from Conferences and Seminars. The organizing secretary can request for special issues or proceedings. Journal Abbreviation: Curr. Res. Pharm. Sci.